The National Lacrosse Season is at roughly the halfway point after this weekend’s action, so we’re getting a good picture of what crowds are looking like for the 2017-2018 season. Disappointingly, they are way down from last season. After two years of slow but steady improvement, this year’s average per game attendance is 8,519 fans, well down from last year’s 9,152. 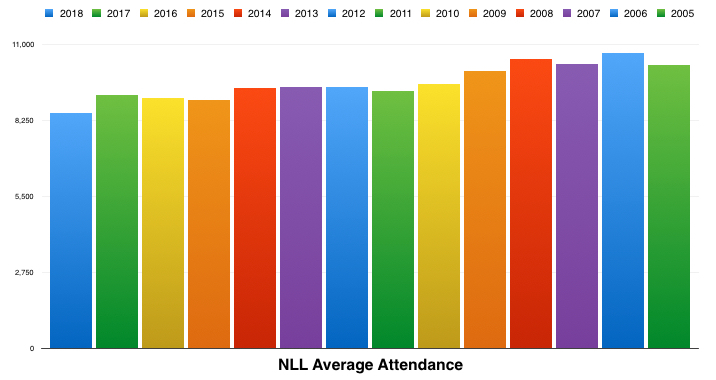 If this number holds up, it will be the lowest attendance figure the NLL has seen since at least the 2005 season (the last year for which the league has numbers available). The general trend has been downward since attendance numbers peaked in 2006—that year the league brought in an average of 10,703 fans per game. But after dropping to just 8,970 per game in 2015, the league saw improvements in 2016 and 2017 (9,050 and 9,152 per game, respectively). The top six teams in the league for attendance are all down this year compared to 2017. 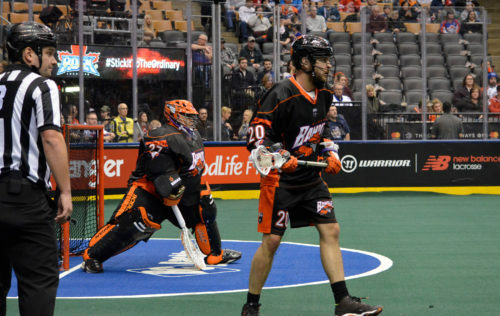 Making the biggest difference are the Buffalo Bandits and Colorado Mammoth. Historically, Buffalo has drawn 14,860 fans per game; this year they’re only getting 12,496. Likewise, Colorado has historically had 15,372 fans per game; this year they’re drawing 12,241. 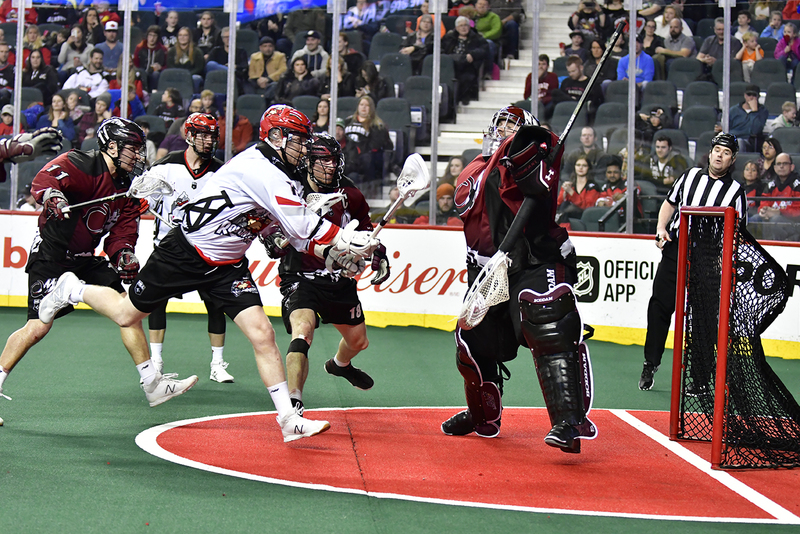 The Toronto Rock’s numbers have been dwindling for years. Once one of the top teams for fans in the crowd—drawing between 13,000-17,000 per game from 2005-2009, Toronto sports fans seem to have lost interest in one of the winningest pro sports franchises to ever play in the city. This season, they’re only managing 8,922 per game. On the upside, however, the three poorest attended teams are actually up in numbers this season. The Georgia Swarm seem to be enjoying the rewards of winning their first championship, with 4,550 fans per game, up from 3,950 last year. The Vancouver Stealth are bringing in 3,735 per game, up from a franchise-worst 3,206 in 2017, despite their losing record. And the New England Black Wolves continue to trend upwards—from their inaugural 2015 season until now, they’ve increased their attendance from 3,914 fans per game to 5,509. The problem is this: the NLL is working hard to expand, with new teams set to begin playing next season in San Diego and Philadelphia. Philly lost their original franchise (now the Black Wolves) in 2014 due to rapidly declining crowds; San Diego is a completely untested market that has never seen box lacrosse. If the product isn’t even selling effectively in it’s current markets, the odds seem stacked against the new franchises having a lot of success. Audience numbers tend to get better towards the end of the season, so it would not be too surprising to see these numbers go up as the playoff races heat up—having Buffalo in first place in the East Division and Colorado in second place in the West may very likely lure more people to those venues. But things do not look too encouraging at this moment.